Way back when I was nine or ten years old, I learned to make a homemade macaroni and cheese recipe from an old microwave cookbook my mom had. This was the first dinner I ever learned how to cook, and it has always been a favorite. Since I got married, I've been playing around with macaroni and cheese recipes and I think I've finally hit on the perfect one! This recipe is super creamy, flavorful, and even makes great leftovers. I always say that this is what macaroni and cheese wants to be when it grows up. The recipe I use now is sort of adapted from both the original microwave cookbook recipe and Ina Garten's mac & cheese recipe, but the final product doesn't bear a lot of resemblance to either. I can promise, though, it is DELICIOUS! 3/4 lb-1 lb elbow macaroni (or whatever smallish pasta you like—I love using shells, wagon wheels, and other fancy noodles). 3/4 lb makes for a cheesier, creamier dish, while a full pound makes more servings. 2 cups grated fresh parmesan cheese (pre-grated parmesan won't add enough flavor). If you don't have parmesan, just add an additional 2 cups of cheddar... but it's not gonna be as good! Preheat oven to 375. Bring a large pot of salted water to boil; add pasta and cook until tender. In large saucepan, melt butter over medium heat until bubbly. Whisk in flour and cook until mixture is bubbling. Slowly add milk; cook for a few minutes until sauce is warm, thickened, and smooth. (It will not be as thick as a regular white sauce.) Remove from heat; stir in salt and pepper. Add cheeses and stir. 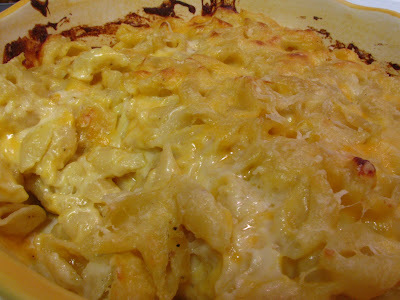 If your pot is big enough, fold in pasta, mix well, and pour into large baking dish; if not, fold pasta into large baking dish, pour cheese sauce on top, and mix well. Dot remaining 2 T of butter over top of macaroni. Bake for 30 to 35 minutes, until top is brown and toasty. Enjoy! Sounds good! I love mac n cheese, too bad Kami can't have any. I remember making your microwave mac and cheese! and I MIGHT even have been there to help you decide that parmesan would be DELICIOUS in it. I'm trying this version tonight. Excited!! Sara - this is way better than the microwave mac and cheese. And nope, I started putting in parmesan after I got married. I saw the idea in a few different recipes. This recipe, though, is basically my own invention.